Lately most of my posts have been about beer adventures I’ve had while visiting various parts of the county, but before summer runs out I wanted to get back to some reviews of local beers. One that I’ve enjoyed on several occasions this summer is Big Star White IPA by Four String Brewing here in Columbus. Big Star is the second beer in the Four String lineup to hit the shelves of Central Ohio beer stores this year. It was preceded by their American Pale Ale, Brass Knuckles, which I reviewed back in May. Having come to grips with the concept of a black IPA (see the post Night of the Black IPAs if you haven’t) you may be asking yourself what exactly is a white IPA? I’m not sure there is a definitive answer to that question, but most white IPAs are something of a hybrid between a Belgian Witbier and an American IPA, preferably one that uses hops with a strong citrus character. The little information that can be gleaned from the can is consistent with this concept of the White IPA, it says “A Belgian American IPA with citrus notes” On their website Four String mentions that wheat is an ingredient in this beer. Big Star White IPA pours a deep golden color. Given my few experiences with white IPAs I was expecting it to be hazy, but it is in fact quite clear. Even a vigorous pour only yields about 1 finger of white head that dies off relatively quickly. The nose is much more like a Belgian blond ale—fruity, yeasty, moderately sweet—than an IPA. The Belgian yeast flavors are front and center in the taste, but you can pick out citrus notes from the American hops in the background. The yeast and hops conspire to give a fairly bitter finish that keeps any sweetness in check. To my palate the yeast flavors seem to have the upper hand with the hops playing a supporting role, but given the fact that this beer checks in at 70 IBU my brain tells me that much of the bitterness must come from the hops. Spicy notes, most notably cloves, are also present. The mouthfeel is on the lighter side, which makes for a nice thirst quencher on a hot day. I’m going on record to say this is my favorite Four String beer. It’s pretty easy drinking, but at the same time complex enough to be interesting. The marriage of Belgian yeasts and American hops is not always a harmonius one, but there is no clash of styles here. The fact that I am having difficulty separating the contributions of the yeasts and the hops is a testament to how well the two flavors work together in this beer. The Belgian side of this beer is much more like a Belgian Blonde (i.e. Leffe) than a Witbier (i.e. Hoegaarden). 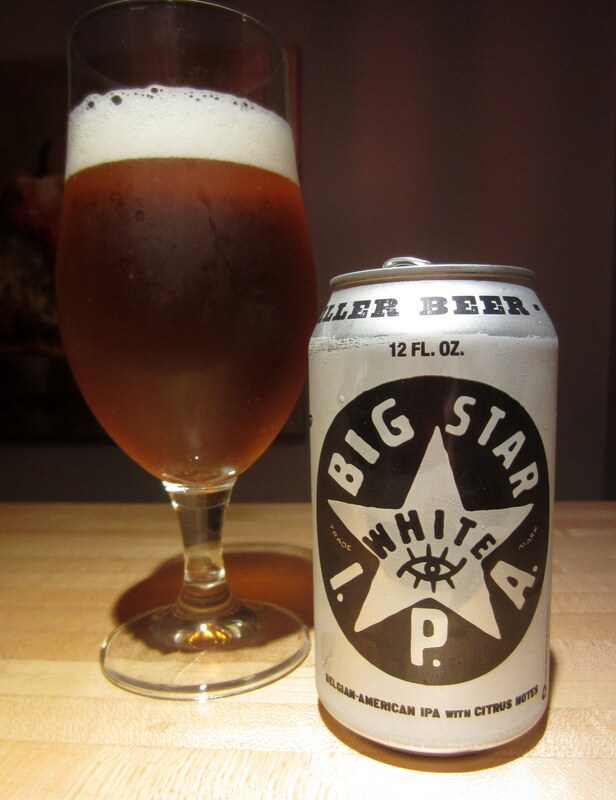 In closing I will add that I’ve had this beer at the taproom a few times this summer (once when it was on cask) and for whatever reason Big Star fresh at the taproom is even better than it is in the can. So if you pick up a six pack and find this beer to your liking be sure to head down to the taproom and get yourself a fresh pint.